You've never been to a meditation centre or monastery before? No worries! You’ll feel at home soon. There’s no dress code, although we recommend modest clothing for both men and women. All we ask is that you remove your shoes inside unless you need them for medical reasons. Young people are welcome at all of our events. Parents can decide what works best for their kids. If you have questions, just ask. Will I be pressured to join or convert?Not at all. Our activities are free and open to curious people of all backgrounds. If you would like to get more involved, there are lots of opportunities. While you are here, you will see people bowing to the monks and to the Buddha statue. Bowing to people we respect is an ancient practice all around the world. Don’t feel any pressure to bow if you are not comfortable doing so. People bow in all kinds of different ways, so no need to try and "get it right." Sometimes our meditation events usually begin with a little bit of chanting that you are welcome to join with or just listen silently. 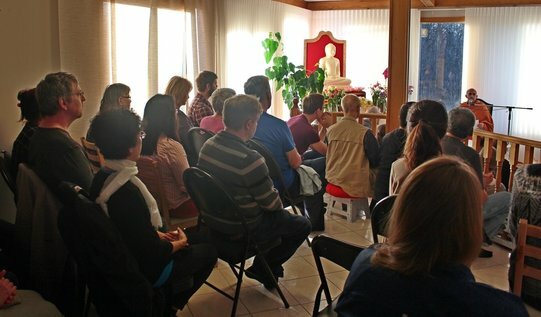 Some of our programs start with a chanting service. English programs will be chanted in English along with the ancient Buddhist language of Pali. We have lots of copies of the service you can read along with. You can also download a copy and some mp3 recordings. It has explanations of everything we recite. You can read more about devotional aspects of Buddhism here. Usually we will begin by offering flowers, candles, and sweet drinks in memory of the Buddha. Then we recite the qualities of the Buddha, Dhamma, and Sangha. We also usually chant a short ancient scripture. If you like, you can just follow along silently. Don't feel pressured to do anything you are not comfortable with. If you have any questions about anything while you are at our activities, never hesitate to ask. If you have any questions now, just contact us.